They aim to provide the best quality of comfort. Takeizumi Sho (manor) is a location that sits at the foot of Mt. Zao, and is a resort hotel. It has a forest that spreads 20,000 meters, as well as a clear stream that heals everyone's hearts and mind. The inside where the wind of art surrounds you, an abundance of hot springs water, and a tranquil kakenagashi hot springs, comes with real Japanese cooking, and the best hospitality. Please enjoy staying here to the fullest. The design and context was "modern Japanese", and using the skills of skilled designers and craftsmen, as well as natural materials, they created the perfect "modern Japanese" world for you to enjoy. They offer various different ways of spending your time here, with different interiors and many useable features in not only the guest rooms, but with spa and fitness utilities, gallery and shop, and even a meeting room for businesses or groups among other public spaces. Surrounded by the scent of trees, a tranquil location to bathe in. With over 400 years of history, and an amazing amount of hot springs water, a well known and loved hot spring Togattaonsen also known as "the god of hot springs", has all the equipment and facilities when partnered together with Takeizumi Sho (manor). It has an open air bath on a wood deck that gives you a sense of spaciousness, a legendary hot spring where you can bathe whilst watching the mountain streams, as well as a huge indoor public bath, you can bathe here to your hearts content. The males Takeorinoyu is a relaxed atmosphere, and if you go outside, you can enjoy the rural beauty in any season whilst enjoying the kakeshi hot springs. We also recommend taking breaks on the wood deck. The women's Mizunaranoyu, is large, with a glass window showing the outside, shows scenery almost like a picture book with your eyes being filled with trees. with the nearby stream as well, it's almost as if you're sitting within nature itself. 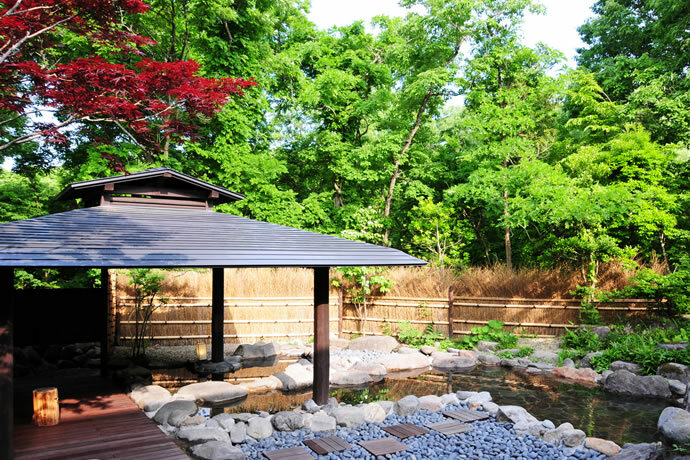 There are 2 different outdoor hot springs which you can rent. Both can be used for free by people staying at the lodge. They need to be reserved, so please keep that in mind. "A Natural counter, cloth made with the Mt.Zao in mind, chairs that have touched the foot of the mountain, with traditional and stylish things, this is a space that warms your heart. Drink alcohol from flashy cocktail glasses together with your friends, and enjoy an evening packed with interesting performances. A restaurant protected by ""kamadonokami"". ""Kamajin is a space that is covered in indirect lighting making it really relaxing. Table seats as well as courtyard seats and semi-private rooms, an iron-board counter is also available for your use. With a ceiling blown with golden leaves, and walls that have character and style, sendaitansu's wine cellar, everything allows you to enjoy our establishment with the best of atmospheres. In our library lounge with a huge, characteristic bell on display, you can all read visual books or magazines whilst drinking coffee from our coffee machine all for free. Also, on weekends there is life piano performances for your listening pleasure. Sendai station bus stop number 33→Togattaonsennoyu is the drop-off, 5 minutes by taxi from there"
Other / There are times when the store closes due to maintenance.